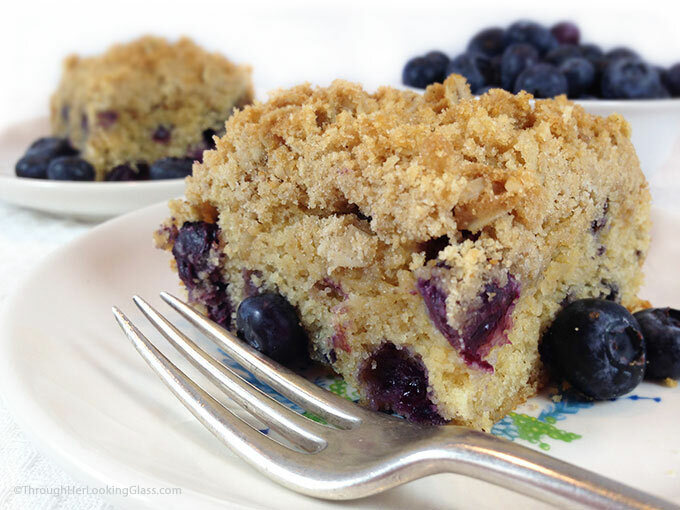 Healthier Oatmeal Streusel Blueberry Breakfast Cake is a moist coffee cake, perfect with a steaming cup in the morning. 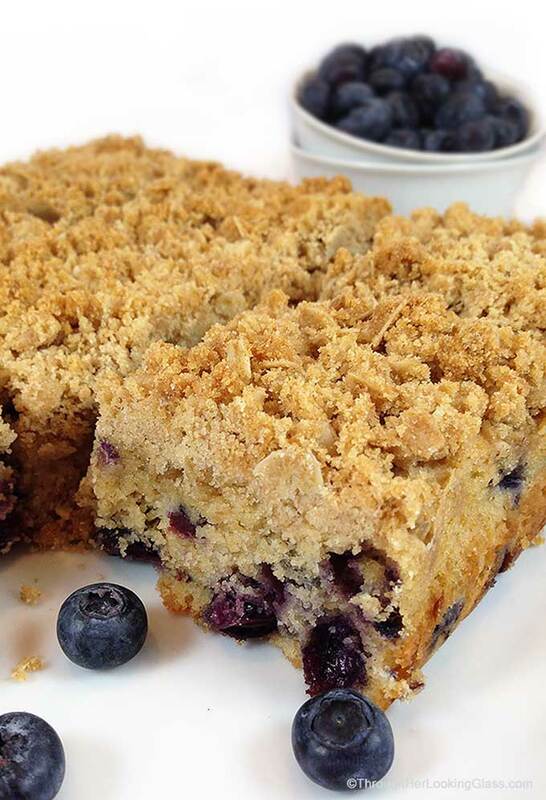 Plump, juicy blueberries baked in tender coffee cake topped with crunchy oatmeal streusel topping. What’s not to love? White whole wheat flour replaces all-purpose flour and coconut oil replaces butter, making this Blueberry Breakfast Cake a healthier breakfast option! All the goodies and none of the guilt. Last week we spent some time over the school break up in Vermont where my extended family have a lake cottage. I really love visiting, we spent a lot of time there growing up. Great memories. But it snowed. Yep. Four inches during the last week of April. I could not have been more surprised. So whaddya do when it snows on “spring” break in Vermont? There’s a cozy little country store in West Danville. Hastings Store. It’s been there for as long as I can remember. Inside are the bare essentials for small town life in Vermont. A few groceries. An ice cream case. Homemade soaps. Post office boxes. A mail window. Friendly folk. Rockers on the front porch. And a little bakery counter where they make the fresh cider doughnuts every morning at the crack of dawn. So delicious still warm. And they always have the best fresh blueberry coffee cake. My Jon absolutely cannot resist that coffee cake. It was the blueberry coffee cake last week that inspired me to try making one at home. I’ve been experimenting a good bit baking with coconut oil, and often replace all purpose flour with white whole wheat flour in recipes. So I thought I’d combine the two in this easy recipe and see what happened. This Blueberry Breakfast Cake is the scrumptious result! It turned out tender and flavorful, packed with plump, juicy blueberries and a crunchy oatmeal streusel topping. We all loved it and I hope you do too. 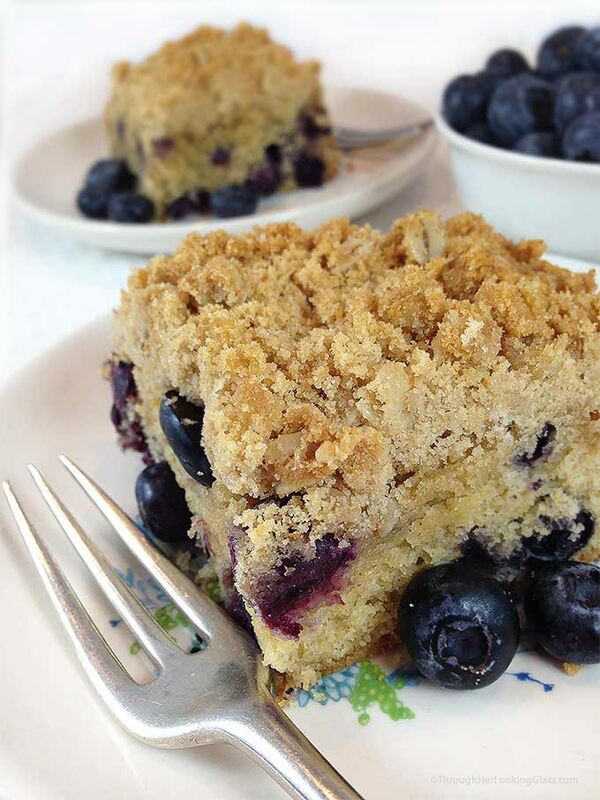 Tender blueberry coffee cake with crunchy, oatmeal streusel topping. Healthy and delicious breakfast cake. Grease an 8" X 8" square pan. Or line with parchment paper. Set aside. In a small mixing bowl, beat egg whites until stiff. Set aside. Measure 1 1/2 cups white whole wheat flour into a medium sized mixing bowl. Add baking powder and salt to the flour in the mixing bowl and stir well. In a separate mixing bowl, cream solid coconut oil together with sugar with an electric hand mixer. Mix in well beaten egg yolks. Add dry ingredients alternately with milk, beginning and ending with flour mixture. Flour berries with the remaining 2 tablespoons of flour. Set aside. Gently fold egg whites into the batter, then add vanilla and floured berries. Separately, in small mixing bowl, stir together rolled oats, flour, brown sugar and melted coconut oil. Sprinkle streusel topping on of blueberry batter. Bake for 40 minutes at 350° or until golden and cake tester comes out clean when tested in the center. I think we're all in "blueberry mode" right now! This looks yummy Allie! Hey girl, you know it's all for you! Come and get it!!!! ? Love the streusel topping! Wish I had a slice to go with my coffee! Boy, does that ever look good! Love Hastings but didn't know thst made more than those incredible cider doughnuts! I had a piece of blueberry crumb coffee cake that some one brought me, from Vermont, a few weeks ago. It looks just like this one. This was the best coffee cake I have ever tasted. Can't wait to try this one! Thank you for another scrumptious recipe Allie! Thank you so much Tracy, I'm so curious where your blueberry coffee cake came form in VT...enquiring minds want to know.....:) I'm guessing it had something to do with your dad. Blueberry breakfast cake? Wow! The streusel topping looks ah-mazing! It would make such a delicious Mother's day breakfast. Can't wait to try this! That store sounds awesome, Allie. Wish you a wonderful Mother's day and a lovely weekend. Cake for breakfast is the best. I love everything about this. Pinned, and can't wait to try it! Allie, I want to make that, it looks so so good!! Thanks for your great recipes !!! I should make it for our next brunch!! This looks so yummy, Allie! I love anything with blueberries and so does my husband! This would be a perfect brunch dish, for sure. 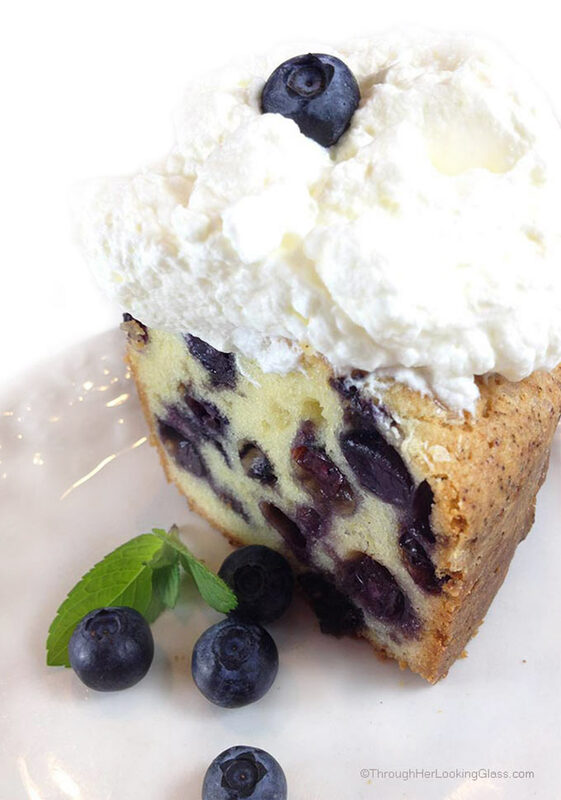 The lake house sounds fantastic and so does this blueberry breakfast cake! 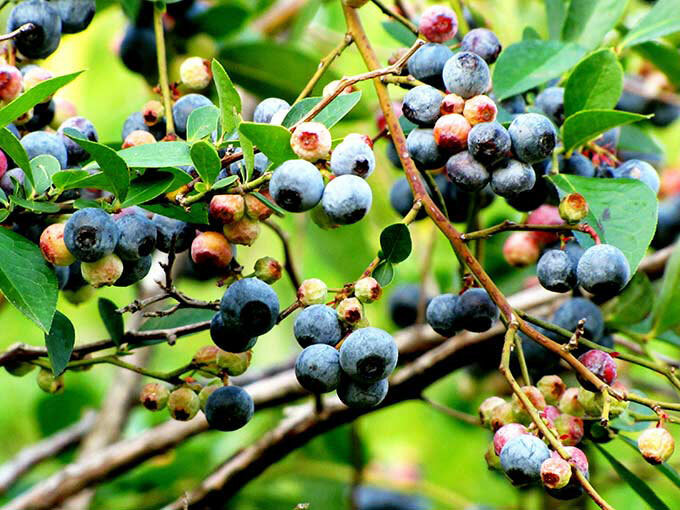 I'm a HUGE fan of blueberries and hope to be successful at growing them someday as I have been growing grapes. That's some "spring" weather you had up there! Sorry it snowed on your spring break! That stinks! But at least you made the most of it. Love this cake and that topping! i became obsessed with crumb cake in college. This blueberry edition looks divine! What a great treat - it looks so delicious and pretty good for you, too! The thought of this with a warm cup of coffee sounds like it would really hit the spot ☕️. I loved reading about Vermont and the little store, Hastings. This post painted a lovely picture in my mind's eye. Too bad the weather wasn't 'springy' (... at all! Snow. ? Yikes!) but it really sounds like you made the best of it. (And shared the best of it, too - the results of the baking experiment it inspired). Well done, Allie. ? Goodness, this looks good. We LOVE blueberries. We pick them in the summer and freeze them. My boys eat them all year long. It is pretty easy to tell when they've been into the frozen blueberries. Blue lips and teeth. Thanx for the great recipe. 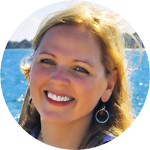 Hey Carin - thanks SO MUCH for catching that. 350 degrees. I will update the recipe. Happy baking! Hi Rebecca - I've not made this particular recipe with frozen blueberries yet, but I've made different cakes and muffins with frozen blueberries. I thaw the blueberries in a colander, let them drain, then take a tablespoon or two of the flour from the recipe (not extra flour) and toss the berries gently with that, then add to the cake batter. I've had good results with this method. Thanks for dropping by and happy baking! I made this using all whole wheat flour frozen blueberries from my dad’s 2016 harvest and coconut sugar. It makes for a denser/darker cake, but it was fantastic. Next time, I think I can cut some of the sugar to try to lighten it up a bit. Thanks for the recipe! Sounds delicious Lonnie! I've just started using coconut sugar in baked goods. I made some cornbread with it the other day. It darkened the color somewhat and slightly different taste, but overall it was a great replacement. No one complained anyway. Thanks for dropping by, loved hearing from you. And Happy New Year!